Through the use of specific hardware and software, virtual reality - sometimes called 'immersive multimedia,' as well as 'virtual environment (VE)' or 'computer-simulated life' - can help replicate or create an environment, based on reality or the imagination of the creator. The aim of VR is to create a sensory experience for the user sometimes including sight, touch, hearing, smell, or even taste. In order to experience virtual reality, the user needs a specific set of hardware. The most important device that helps the user immerse in the virtual environment is probably the head-mounted display (HMD) - a wraparound headset which does not allow light or images from the real world to interfere with the virtual one. The installed base of virtual reality headsets was estimated at around seven million in 2016 and is forecast to grow to 37 million by 2020. The Sony PS VR was the best selling VR device in 2017 with 1.7 million units which is estimated to reach 2 million units in 2018. 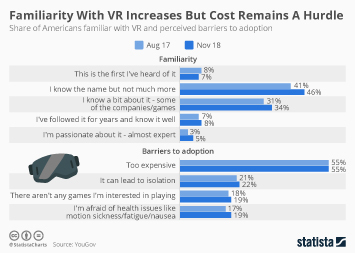 Other virtual reality devices of which at least 300 thousand units were sold in 2017 include the Oculus Rift, HTC Vive and the Windows Mixed Reality. The VR industry is growing at a fast pace, with the market size of virtual reality hardware and software projected to increase from 2.2 billion U.S. dollars in 2017 to more than 19 billion U.S. dollars by 2020. Another forecast projects revenues from the global virtual reality market to reach 21.5 billion U.S. dollars in 2020. Mobile based virtual reality head-mounted displays are forecast to account for about 75 percent of global VR display sales by that time, as the number of mobile virtual reality users worldwide is forecast to grow to more than 130 million.